/ Coffee culture/How do you drink your coffee? Here is a small survey of the Handpresso team. How do you drink your coffee at Handpresso? On your way to work, in your car with the on-board machines? Or with the portable espresso maker in the office? I only drink coffee on Sunday mornings. To have the time to enjoy it. I drink a long black coffee without sugar, with a couple of toasts warmed in the toaster and covered with salted butter. It’s my week-end treat! I start the day with one, two or three coffees. I use my automatic coffee machine, which is a coffee maker with grinder. The big guns ! It looks like a professional coffee machine. At work, I use the handheld coffee maker every second hour until 4pm ... and resume the next day. I’m a die-hard espresso lover! On weekends, I do the same in the mornings and wait till the nap is over to drink the next coffee. Whenever I'm in the car on my way to meetings, or to bring the children to their activities, I have an espresso with my car coffee maker. A real treat! I start the day with an orange juice and a bowl of long coffee that I drink together with bread and butter. Short coffee is not my cup of tea. Even in Italy, I do not use the Italian coffee maker. I may drink a cappuccino on holidays, but very rarely. I never drink coffee. I like the smell but not the taste of it. So, I'm a heavy tea drinker. I do not use a tea machine or nespresso tea capsule, just loose tea. In the morning, to wake up, I put instant coffee in a cup. Thus, I can bring it quickly with me to the bathroom and drink it while getting ready. Once at work, I drink 2 espressos that I thin down a little but try to stick to that. Just try! An average of 8 coffees a day, on vacation only with the Handpresso Pump. I drink 4 coffee in the morning -and mornings are longer in summer- the others in any case no later than 3pm. I never drink coffee before lunch. Coffee brewed with my percolator brings the meal to a close, at noon or in the evening. It's always a real espresso, prepared with an ese pod that I drink with sugar. I do not like Senseo® coffee, tassimo® pods nor nespresso®* capsules for that matter. Nobody asked me, but the only coffee I drink is 100% arabica espressos. I have one after lunch, two at the most. I always prepare it with my manual espresso machine. At the office, I use a kettle to heat the water, outdoors I always bring a thermos. 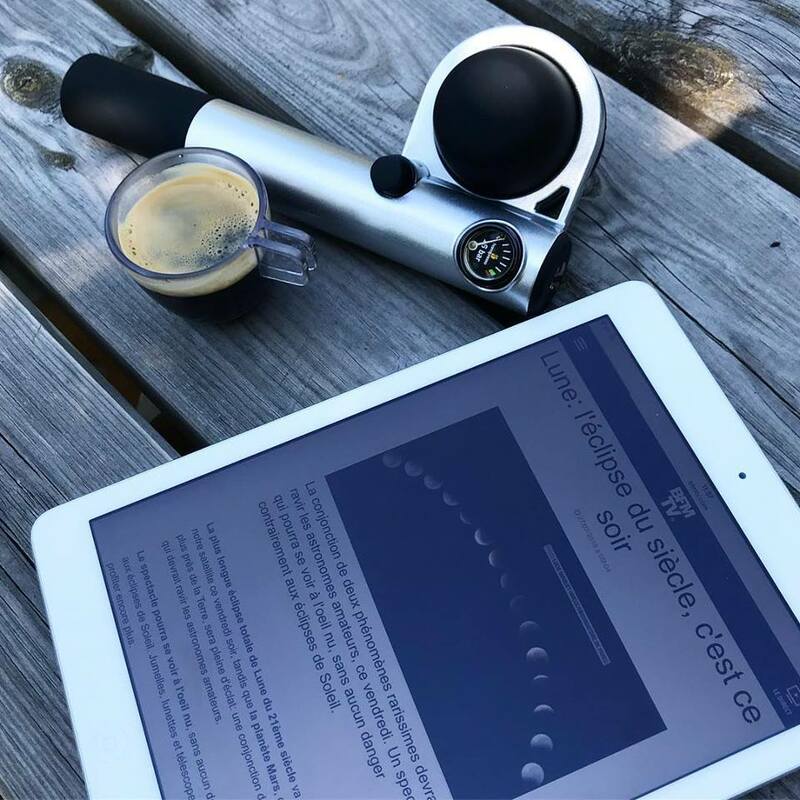 *® Senseo, tassimo and nespresso are third parties and have no connexion with Handpresso SAS.